I have sporadic insomnia, so the other night I just woke up in the middle of the night and couldn't go back to sleep. I decided to get on Insta and was looking through the stories. One person that I follow is Katherine from Beyond the Black Suit— I've actually been following her since she was at her old blog and she's one of my favorite lawyer bloggers. Anyways, she had posted that she was sitting in on a murder trial in Dallas and that a reporter was live Tweeting it here. It was perfect because what else are you going to do at 4am than read a play-by-play of trial haha. Reading this reminded me that I haven't really told y'all about the murder cases that I've been involved with. I won't go into details on the facts of the cases, but I will give y'all links to news reports on them because let's be real we're all nosy. When I was doing my observership my 1L year, the first trial that I sat through was this murder case. During my 2L year I was reading our school's daily email that said the local public defender's office was looking for help on this murder case (it's still open) so I signed up to help. Spoiler alert: neither were anything like HTGAWM. If you've never sat through a trial, I highly recommend you go. Just call up the court and explain that you're either in law school or wanting to go to law school and want to sit through a full trial. Usually court staff, judges, and lawyers are super nice and will set you up with a time and place to watch. And if you're still in undergrad, this is a great experience to mention in your personal statement if you don't have any other legal experience. It was such an eye-opener for me that I even talked about the first murder case in my transfer personal statement. On HTGAWM Annalise Keating is all about discrediting the witness, introducing a new suspect, and burying the evidence, but that's not exactly what I saw in trial. In a different non-murder case, the defense lawyer actually explained to me that the two most common defenses are either "it didn't even happen" or "it happened but it wasn't me," which I thought was interesting because from what I've seen, that seems to be generally what they do. In this case, the prosecution was even arguing that this couldn't be considered self-defense because the victim was standing on the sidewalk which was technically an easement by the city and therefore public property. I thought this argument was pretty interesting because who ever is sitting in property learning about easements thinking that it might be an argument in a murder trial? Overall, the case was much slower than what you see on TV. 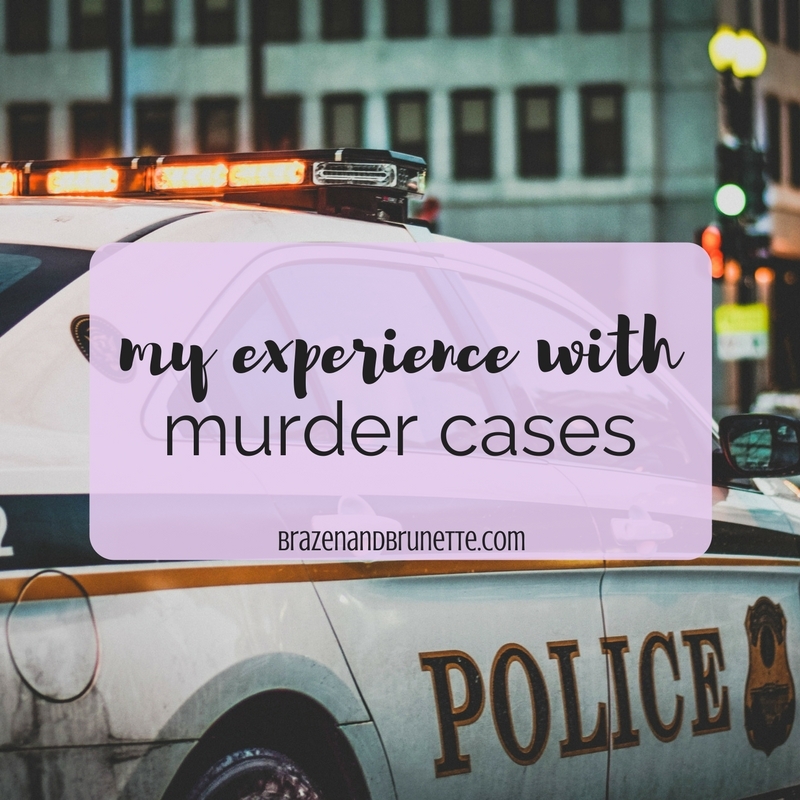 Most of the time was spent explaining who a witness was and why they were relevant to the case or connecting evidence to the case. For the second murder case that I was involved with, my job was to review some of what they got in discovery. As much as I wish that it was like HTGAWM, it wasn't us sitting around finding juicy information that the case could turn on. Instead, it was a lot more monotonous. Remember in Clueless when Cher helps her dad by going through all of the phone records and looking for calls with a certain number? Yeah, what I was assigned to do was about that exciting. But since there was so much discovery to go through, it was like HTGAWM where we all were just sitting around with laptops on our laps and chatting while we were searching. One of the best parts of this was that there were 3Ls in there doing research on cases to support arguments for the case since they were a part of the clinic. I got really close with them and from what I saw, if you're interested in this then I would seriously look into doing a clinic where you get to actually be heavily involved in the case instead of just reviewing files. 1. Bring a jacket— Courtrooms seem to always be freezing so you'll be grateful for a jacket. Also, you might be asked to put one on if you show up in something sleeveless. Remember that it's best if you're dressed business professional in a suit. 2. Leave your phone— Even if you put your phone on vibrate, courtrooms are actually pretty quiet so the buzzing noise would be very obvious. Courtrooms have a no-phone policy so this could get you kicked out and on bad terms with a judge and a few lawyers. I would leave my phone in my judge's chambers and it was just close enough that my apple watch could reach so I could still screen texts. Oh, and a tiny game of pong is a great apple watch game to play during down time. 3. Bring something to write with— I always brought my padfolio and a pen with me and would write down all of my questions that I had and then when the jury was out for lunch, I'd ask one of the lawyers or the judge to learn more about what was going on. Don't just pick the defense or prosecution lawyers, go meet both of them! It's so fascinating when one side tells you their plan and then you go to the other side and hear their thoughts on the case because you feel omniscient. 4. Network— When trial wasn't in session, I'd always chat with the lawyers coming in and out of the court. This was pretty easy because it was the same group of lawyers almost every day so I got to know them and they got to know me. This paid off big time when one of the lawyers said that they had some big cases coming up and were looking for a law student to help them and asked if I wanted a job, but sadly I had to decline since I had just found out that I was transferring. This is why having some professional business cards stashed in your padfolio will come in handy. All you need is your name, contact information (cell and school email), that you're a candidate for doctor of jurisprudence for your graduation year and your school, and you can even include your LinkedIn information so they can view your resumé. This is so cool! hahaha I actually passed this post on to my brother, who is in his last year of studying law. Hence, why he enjoyed all the cases that you attached. Great post. Really enjoyed it.